Gareth McClure is a MBA student at the University of Alabama. Gareth grew up in Northern Ireland, studied law as an undergraduate in Southampton, England, and has a Masters in Information Technology law and Telecommunications law from the University of Strathclyde in Glasgow, Scotland. Prior to embarking on his MBA, Gareth worked for almost three years for the Vodafone Group, a leading global mobile telecommunications company, at its headquarters in England. Being part of Vodafone’s Group Legal Department supporting the business in a variety of legal roles inspired Gareth to get his MBA so as to further advance his career. Some highlights from Gareth’s first year at the Manderson School of Business have been presenting a team case competition in New York on the Super Bowl, presenting to managers from Target in a case competition, and working part-time as a graduate assistant for the Small Business Development Center. 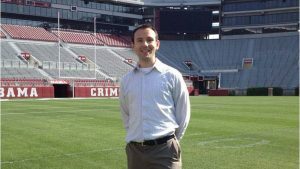 Working on projects supporting small businesses in Alabama allows Gareth to continue to develop his career professionally and gain valuable experience while studying.